To order blinds that are very similar to mine (mine are out of stock), click this link here. NOTE: If you place an order for ANY window coverings from Select Blinds, be sure you use my special link HERE for the best possible discount! Plus if also put in my code INSP1RE5 you’ll receive an *additional* 5% off the very best price offered anywhere! There is a special discount ordering code and link available near the end of this post so don’t miss it! Thanks so much for all your super nice comments about my kitchen remodel and reveal. I have to be honest, I was scared to post thinking maybe it wasn’t good enough or people wouldn’t like it, so thanks for alleviating my crazy blogging fears. It is scary being a blogger sometimes, putting yourself out there and not knowing what will happen. BIG SIGH OF RELIEF! Thanks! One of the most frequently asked questions on the kitchen was about the bamboo blinds. Since I haven’t posted about the blinds yet I decided to answer the question of where I got them and what they are so you can find this answer later if you need it! Rest assured, I’ve read every single comment and will answer all of the questions in my upcoming kitchen source post and the DIY island makeover post. To see similar blinds to mine (mine are out of stock), click this link here. So, after seeing how my kitchen was coming together late last fall and once all my window trim was painted in the whole kitchen family room, I actually loved the open clean look of NO blinds! But, alas, we don’t have the best view and wanted a little more privacy at these windows, so I decided that I was going to go with my long-time loves at the windows — bamboo blinds. I had a variation of these at my old house too and loved them! Above is what the family room looked like as we were painting it and with our previous blinds. While cloth roman shades or curtains are always pretty, the bamboo roman-style shades just seemed like the most logical and practical choice for our rooms. They bring the warmth of natural wood to the upper part of the room, balancing out the warmth of the floors. I LOVE the texture and style. They would look good with any decor for years to come (unlike a trendy fabric that might grow tired, not match a current color scheme, or get dirty). Plus, I always have the option of adding curtain panels if I want to so all around, bamboo was a winner! I’ve always loved these particular tortoise bamboo shades because of their coloring! They add so much to the overall feel of the space. Once I ordered them, I was worried they would make the room too dark but they were really just the perfect finishing touch. Texture in a room is SO important and every layer makes such a difference. When you look at them closely, they have an almost greenish tinge mixed in to the natural wood tones, but that is actually why I chose them over other options, I wanted to create more depth with my color palette — the multi tone effect in the bamboo with a slight hardly even perceptible greenish tone is really pretty with the shades of blues I have in the kitchen. Multiple shades of blues and greens gives so much more interest than selecting everything the same tone and shade. For continuity and flow throughout the kitchen and family room, I chose the same blinds for all windows including the sliding door. I can get away with blinds on the doors with an inside mount, because my doors are quite tall. The door blinds are actually two blinds so you can open and shut them independently. Same with the family room blinds, which are three separate blinds all on the same header. All of my blinds in these rooms are inside mount because I love my window trim. If you don’t like your trim, have no trim, want to mount your blinds higher than the windows, or your window frame isn’t deep enough to accommodate blinds, you can order them to be outside mount. Either way, they look wonderful! Mostly we got these bamboo blinds for how awesome they look when they are pulled up, but also for those two hot sunny days we get in the summer here in the NW, or for the days that we want a little more warmth in the house or privacy. They pull up and down like a dream so that makes it more likely that we will open and shut them regularly! I would like to get more of these for the front of the house and the dining room too. On my wish list for someday! We do not yet have a place to wrap the cord, so that is next on my to do list. I plan to attach a small hook to the side of each window to keep the cording tucked out of the way. The Inspired Room readers can get the best DISCOUNT (40% off) plus any special offers on any orders from Select Blinds using the following code when you order >>INSP1RE5. The blinds were so easy to order, I actually did all the measuring myself and ordered FROM MY PHONE. Risky all around but they turned out beautifully and I couldn’t be happier! They were super easy to install, my husband and I put them up together during what we called our “blind date.” Best blind date I ever had! And if we can install our own blinds, I know you more skilled DIY’ers can too! Find FAQ on my blinds: here! Stay tuned for more details on the kitchen! I will answer all the questions you had and give sources too! Could you possibly post a picture with them down? I want wood / matchstick / bamboo blinds that filter the light, not completely block it out. I’m wondering if the style you got would work. I ordered a sample of similar ones and it seemed like no light would get through at all. I’ll try to get some pics soon with them down. They do cut out light but not completely block it like if they were solid or had a liner :-). Those blinds were the perfect choice for your beautiful kitchen! 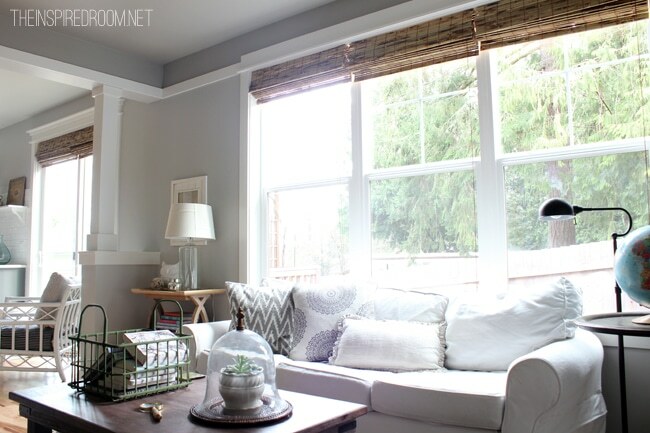 They add nice color and texture – definitely one of my favorite window treatments! Beautiful room! Love the look and warmth of the wood–I’m just wondering how they look from the outside of the house? I only used lined curtains, because I like the look of all white–not sure how they would look from the street. Oh, and I think you can get them lined! Forgot to mention that! LOVE the blinds (I have the same kind in my Family Room!) And LOVE the kitchen too!!!! It is so nice to ba able to redo a kitchen for yourself and be able to have no upper cabinets (looks soooo clean and fresh!) or open shelving. Builders would never do that because they think everyone wants lots of upper cabinets. I just love how your kitchen looks without the upper cabinets! VERY nice job! Congrats!!! Thanks Katie :-) so good to hear from you!! 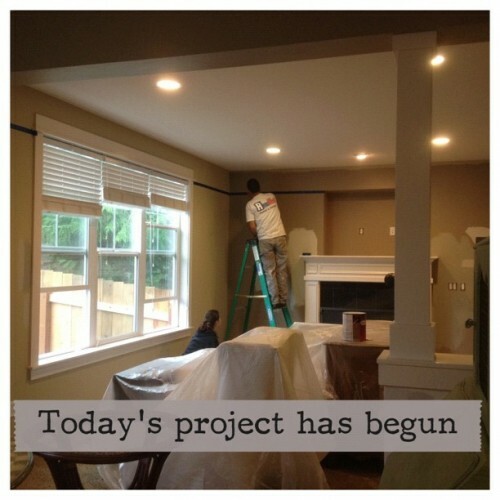 Thanks for posting about the blinds Melissa! I’m shopping for blinds now. We just purchased a 1920’s beach bungalow! Finally I have my beach cottage! Still hoping to hear where you got your mop that you use on hardwood floors and what you use to buff/polish the floors. Our house is going on the market next week and I’ve got to buff the floors. Thanks for posting on the bamboo shades! And I love them hung inside the trim. Oh you lucky girl you!!!! Wow! That’s going to be fun! The mop is from Home Depot, or lowes. But I think Home Depot! :-) good luck! Can’t wait to see pics of the new cottage! Thanks! oh, I know just how you feel! Good luck in getting settled!! these are my go to blinds..i have been using them for years love them! These are such a great choice. I too am a fan of the color you selected. I love the look of them. 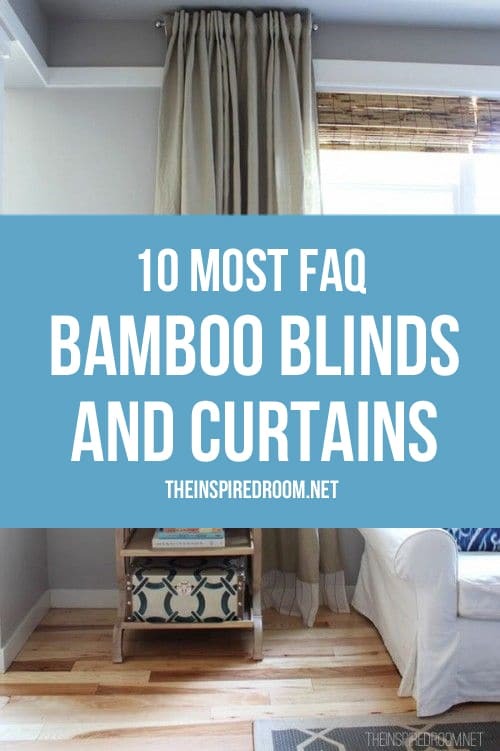 I so wish I could use them in every room of my house, but the only downside I found is in the front of my house, it blares sun, I can’t filter the bamboo blinds. They are either up or down. I kicked myself when I had to take them down. Good thing the rest of the house doesn’t have the sun problem. I’ve been following your kitchen remodel and have to say it turned out stunning. I even want to paint my kitchen island a dark color like your bottom cabinets. That was my question too! LOVE everything, Melissa~your blind dates proved to be very successful. :)Thanks for the info! I’m a big fan of bamboo shades! I have them in my kitchen too! Love the look. You did great. Beautiful kitcheeennn!! I have bamboo blinds on 27 of my 31 windows and have loved them for 5 years now!!! I am so glad I went with that. You’re right, they look awesome up OR down. Mine are usually up but when it gets too hot they help keep that heat out. I have curtains on just a few windows. But they really do look great on their own. I bought mine on Overstock for under $20.00 each!! Best deal I found by far. Oh, and your new kitchen is gorgeous! ABSOLUTELY GORGEOUS !! I love the simplicity of it all which in my opinion makes everything especially beautiful !!! So pretty! I was thinking of using plantation blinds on windows over sink in my kitchen reno, but you’ve made me reconsider! They are lovely and you did a good job. Besides, if they are “good enough” for you and your family, they are good enough. See? When I lived in an urban area (hopefully never again), I used bamboo blinds and enjoyed them. Should I ever live in an area where I have neighbors, I’ll return to bamboo blinds in the kitchen and bathrooms. In the rest of the house, I adore being able to open/close drapes/curtains against the night. Well done on the kitchen redo. Love the woven woods!! I think they are especially pretty when the view from the window is nature. Another PERFECT detail! Yet again you have inspired me… I too have an open kitchen/sitting area/dining area with lots of windows and a few doors and figuring out window treatments has been *impossible*. I am going to try tortoise blinds (and, in fact, I have some from our last house that will work!). For a nautical touch, try cleats for the cords — they are perfect here too! Before I put anything on my windows, I have to wait until my apartment building has finished replacing all the windows. My unit is going to be “before the end of 2014” so I patiently wait and continue to ahh and ooh over what others have done to theirs. I am pinning this so I have it in my boards! They look beautiful! I bought bamboo blinds for the same reason you did. We absolutely adore our window trim we put in and didn’t want to cover it up, plus I love the open feel you get from having them up. I bought mine at Lowe’s and had them cut to size. The only problem I have is the cord. I’m going to have to come up with a solution. Right now I tend to tuck them behind the blinds, but then they get tangled. They look beautiful in your kitchen! I’ve had the exact same blinds (Bamboo Tortoise) for a few years in both of my kids’ bedrooms and they are still in great shape. Thank you Marne! :-) Yay! Love them! I’d like to get these in my family room — the texture would be so great. Thanks for sharing your resource! BTW…I was surprised that you were nervous about posting your kitchen reveal — YOU, the blogging guru with such a decorating gift! Just goes to show we all get nervous about something once in awhile. :) So glad you went for it and posted despite your fears! Haha, well thank you. I’m always a little nervous when I post because I am inclined to do what I love and want in my own house, not necessarily what is the most popular or trendy thing at the moment. That’s kinda risky online, but it is worth it to me to just do my thing and not worry about what everyone else is doing or might think. Until I go to post it — then I start realizing it is time to be nervous hahah!! Sigh. Your blinds do look great, I really like them! I’d love to get rid of my heavy curtains in the room off the kitchen and use blinds like this! They warm up your windows and are just right for your room! I’m going to have to look into the place where you ordered yours from. Thanks for sharing that info! You could open the door if the stationary side was pulled down and the door side was up. You’d want to hang them out far enough in the frame that the door can slide freely, so if your frame isn’t deep enough that might be a problem. Even if the door does get hung up a bit when you have the blind down and are trying to open the door, you could pull the shade out slightly with your hand when you open the door just to prevent any possible hang ups. But if the blind is installed far enough to the outer edge of the frame it is probably going to be fine. And of course, you’d also want to measure the height of your doors to make sure that people can still walk under the blinds when they are up. :-) Hope that helps a little? They look really great! Makes me want to put some in mt kitchen. I love the look of them a lot. Out of curiosity, what do you have framed next to your sofa? It looks like some old letters or some sort of printed documents in a collage? Love your ideas! Blind Date! 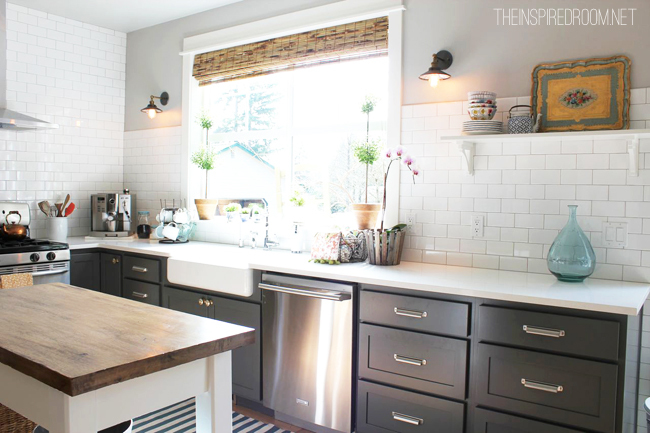 Thats just too adorable…i’m adding woven blinds to my kitchen as well. I love the look, sleek and natural. And you are way to modest about your kitchen, it is a knock-out!! Everything is just so beautiful!! Love every inch of it…you have done such a great job!! And congrats to Jack for his special honor…he deserves it..that cutie pie!! Thanks so much for the info on the blinds. We’re in the process of buying a new home and very close to getting a house – I’ve got lots of ideas in my head and these blinds were one of them. Your information was very helpful and I love how they look on your windows – perfect texture. Your kitchen is really beautiful – congrats and enjoy it! What a creative date with your husband..a BLIND date. :) love that. We put them in our kitchen this year, too…makes such a difference…and totally adds warmth and texture to the room. The whole reveal looks beyond amazing, Melissa! They look so beautiful in your space! I love the color ad texture they add to a neutral backdrop! I’m a huge fan of the fact that you ordered them online! That takes a lot of guys that I haven’t had yet!! With such great results I might look into doing that! We need wood blinds in our dining room! Just discovered your blog and love it! Where is the tiered side table in your living room from? I’ve been searching for something like that for our guest bedroom!! I got that at Lamps Plus! I LOVE it! Thank you for the great write up Melissa and love the blog! We really appreciate your kind words about our products and ordering process. FYI, if you are planning on doing any more room makeover projects, please feel free to contact us for a possible sponsorship. My name is Nate Kennedy and I am the VP of Operations at SelectBlinds.com. I want to start by thanking you for ordering our product. You have a beautiful home and the product complements your décor perfectly. In reading your post I noticed you commented on the fact you were able to order these shades from your phone. We have recently launched a mobile version of our site and I am curious if you could tell us which version of the site you utilized for this purchase. Hi Nate! I wanted to order these blinds for my kitchen window (LOVE the way they love in her house! ), but noticed there isn’t a “bamboo tortoise” color…is your “bamboo rustic” the same thing as what Melissa has in her house? Thanks for the info! Melissa–I love, love, love your blinds, but I REALLY love your window trim…gorgeous!! Our supplier was temporarily out of the Bamboo Tortoise color, although the Bamboo Rustic is very similar: http://www.selectblinds.com/bambooblinds/bamboo-shades-details.html?clrid=620 . However, the Bamboo Tortoise is now available on the site again. http://www.selectblinds.com/bambooblinds/bamboo-shades-details.html?clrid=619 . Thanks! 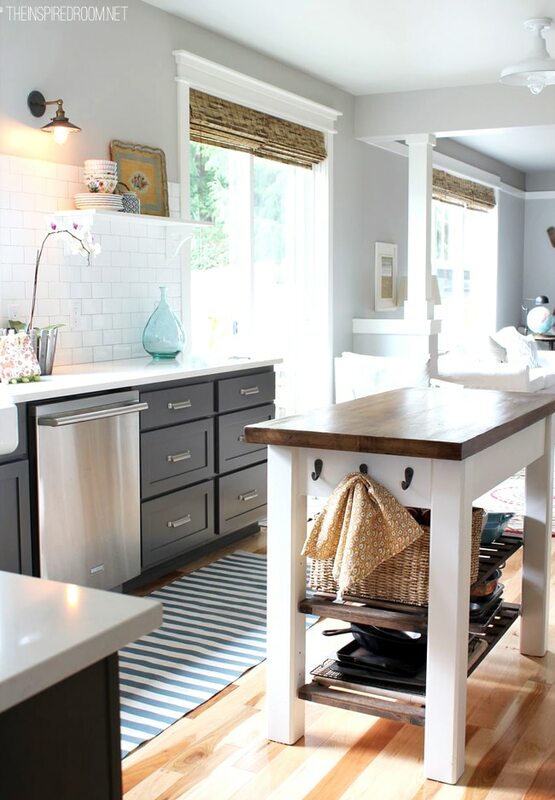 Love your kitchen island!! Any chance you know the dimensions? I can’t seem to find that color of blinds on there web sight. Can you tell us how to find it thanks. Looks like they might have changed the name to bamboo rustic? I think it’s the same! Absolutely LOVE the kitchen. One question, where is your microwave??? I have the same layout as your “before” kitchen with the microwave above the stove. I would really appreciate your response. What’s the name of the paint color and trim? Can I ask the make and color of your flooring? it is gorgeous!! 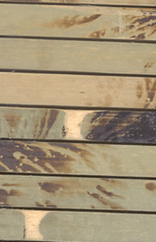 I am currently looking at flooring due to a slab leak and ran across your blog on pinterest(: It is beautiful and so helpful to this challenged decorator. I really like the stainless steel appliances because it gives the room a bit of a modern touch. 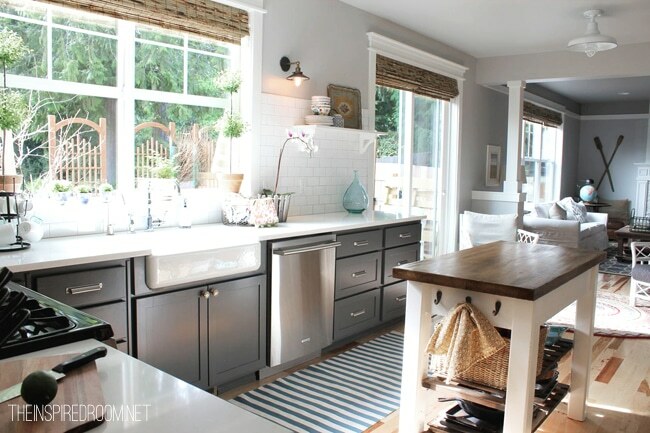 The light hardwood floor looks gorgeous with the farmhouse sink. You really nailed everything from the color scheme to design to open floor plan. Unlike other kitchens, everything was strategically placed rather than jammed together. This kitchen is beautiful. Would you mind sharing the color of grey paint you have on the walls in the picture? Hey there – love your style!!! We want to get these blinds but we were wondering if you think they would look ok with a blue/gray paint on the walls. We ordered a sample and it looks so green…is the green overwhelming? Gorgeous blinds! I’m hoping you can help. I have an extremely large sliding door. The window frame around the slider is approximately 98″ wide. It appears you have several hanging in your living room window but can you tell me if they’re on a rod. Any details you can provide would be greatly appreciated. I think this will be my only option outside ordering a custom shade. Thanks in advance for your help! What collection/ color are the ones you have from Select Blinds? Mine are the Tropical Aisle – Bamboo Tortoise color! Thanks for the post and the shopping code. Do you know if the code is valid on only certain styles? I tried to use it on the woven wood shades and it says the code is invalid? Thank you! It should work, let me check and get back to you! I tried to use the code today with no luck. Hmmm, I’ll ask about that. Although I think if you click the link I provided it will still apply the best possible discount! I’ll get back to you when I know what’s up with the code! Thanks for letting me know. We have had an unusual snow and ice storm over here in Lake Oswego, just outside of Portland, Oregon since January 7. It has been a full week since I last saw my kinder students. I have been taking advantage of these SNOW DAYS and have been painting two rooms in our 1979 ranch. 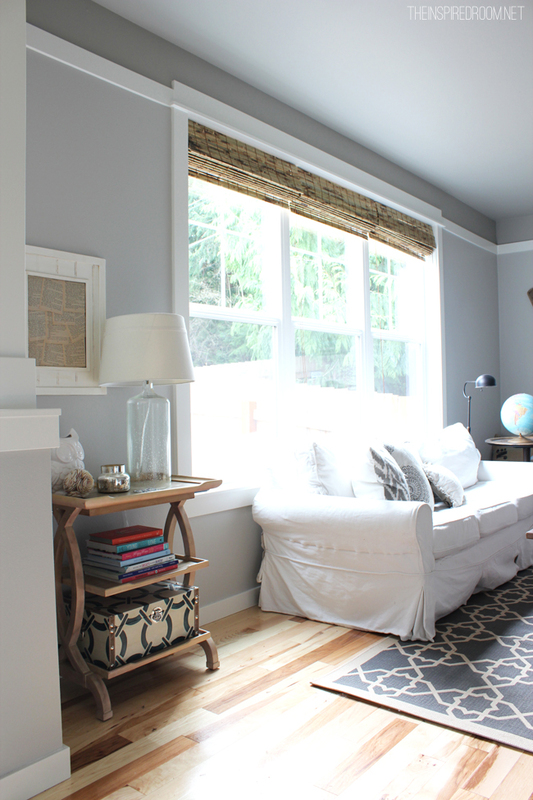 I just finished painting our den/tv room a very pale grey 50% Benjamin Moore Abalone. I also had trim put up and painted it Benjamin Moore Simply White. I was so lucky to see your post about blinds today and am now very inspired to locate the Bamboo Tortoise color at Select Blinds. Does this color still exist? I am having difficulty locating it. Hi Linda! I’m from Lake Oswego! My mom still lives there so I’ve heard all about the crazy weather you’ve had. What an unusual January for Portland! I’m glad you are finding your time off to be at least somewhat productive. I am going to look for the exact link you’ll need and get back to you ASAP. Thanks for your patience, the link used to go directly to what I had so I’ll figure out what happened and let you know. Thanks! Hi! I’m trying the code as well and it’s not applicable or valid. Hi Karen, oh I’m sorry about that! I just updated the link and code in the post, if you can try again with that and let me know if it works for you!! 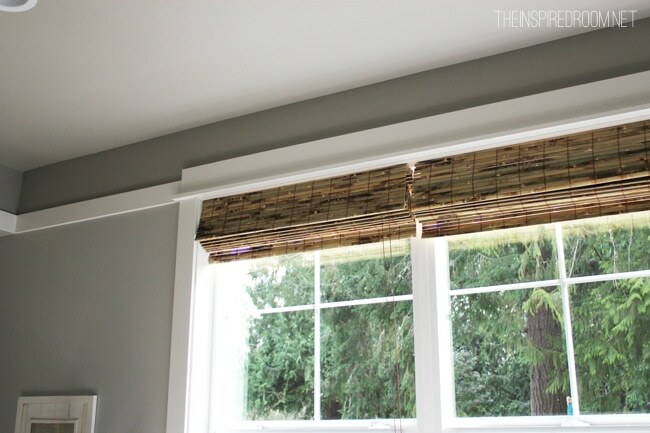 I’d like to use bamboo shades in my bathroom (inside mount) but don’t want a valance. It looks like you have them mounted without one, but when I go to the site it says it is included. I have another shade I got through Pottery Barn and it has a stainless band at the top so a valance has to be used to hide it. Can you give me any insight on this? Thanks!